Let our ColorIt Colored Pencil Set help you free your creativity and create colorful art that impacts others. Every color pencil set comes with 48 high-quality colored pencils, 1 pencil sharpener, a black nylon pencil case, and gift box with magnetic closure. Our premium coloring pencils are ideal for creating color pencil art, colored pencil portraits, or pencil sketching. Also great to be used as drawing colored pencils, colored pencils for artists, or blending colored pencils. ColorIt searched relentlessly to find a manufacturer that would deliver the best colored pencils. We accomplished this task by making it our priority to produce art coloring pencils that leave behind a smooth finish. Just as important, was selecting vivid pigments to bring out the creative inspiration in our fellow colorists by choosing colors that pop. Lastly, we created a product that allows customers to take their love of coloring wherever they go, by including a portable travel case and colored pencil sharpener. ColorIt is comprised of a small, close-knit family dedicated to finding the best possible materials, while focusing on top-quality production. Our approach allows our hand-drawn artwork to amaze and inspire. Do you love coloring? So do we, and that's exactly how ColorIt was founded - with our high-quality adult coloring books. ColorIt is branching out and creating coloring pencils for adults. Our art colored pencils imitate the same level of quality as our adult coloring books in regards to the overall customer satisfaction. Whether a customer's passion is creative drawing or coloring, we believe that by creating the highest quality products in this competitive market, our fans will share our love of art and free their own creativity. So, what are you waiting for? Free your creativity and come see why ColorIt's pencils are the best colored pencils for adult coloring books! SMOOTH FINISH - The ColorIt Colored Pencils Set is a must have for any coloring enthusiast in search of a nice smooth finish. While some coloring pencils flake, ColorIt art coloring pencils provide the right amount of softness needed to leave a brilliant masterpiece behind. A harder pencil could have been chosen, but colorists would not get the same vibrant colors or smoothness in their finished products. VIVID PIGMENTS - With 48 calming colors to choose from, the ColorIt Color Pencil Set generates an endless amount of creative inspiration for any colored pencil artist. Colored pencils are wax-based and come with the color name and color code printed on the barrel. PORTABLE TRAVEL CASE - Premium nylon case and bonus colored pencil sharpener make coloring an activity that can be done almost anywhere. Case includes a single zipper and slot for each colored pencil, which not only minimize the amount of prepping done before a coloring excursion, but also keeps coloring tools organized. 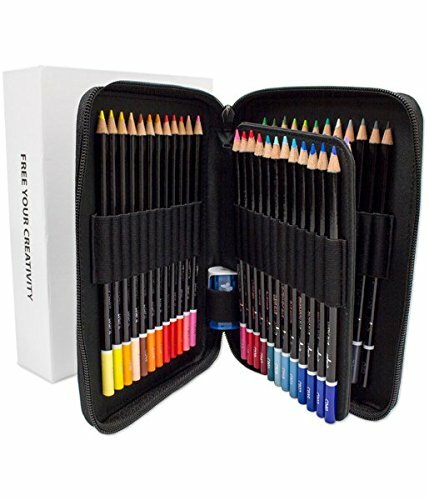 BEST COLORED PENCILS FOR ADULT COLORING - Set includes 48 high-quality colored pencils, 1 pencil sharpener, a durable black nylon pencil case, and a gift box with magnetic closure. Ideal for creating colorful designs, color pencil art, colored pencil portraits, or pencil sketching. Also great to be used as drawing colored pencils, colored pencils for artists, or blending colored pencils. 100% SATISFACTION GUARANTEE OR YOUR MONEY BACK - ColorIt takes pride in providing premium products and quality service. Try our coloring pencils for adults hassle-free and if you are not satisfied, return your art colored pencils for a full refund within 30-days. If you have any questions about this product by ColorIt, contact us by completing and submitting the form below. If you are looking for a specif part number, please include it with your message.